﻿A picture is worth a thousand calories right? 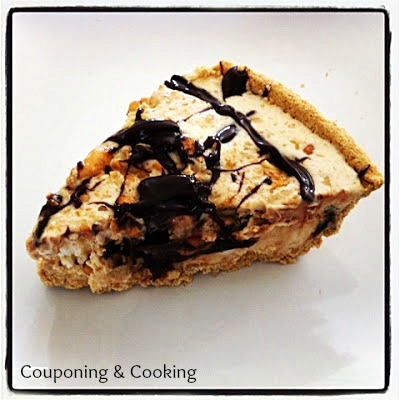 A slice of my mom's Peanut Butter Ice Cream Pie probably comes pretty close to hitting that mark but it is so worth it. This is a dessert I usually save for summer time but here in South Florida it was so warm last week you would have thought it was June so I figured why not? The great thing about this dessert is that it covers all the bases. It has chocolate, peanut butter, ice cream and some crunch from the cashews too. Hopefully you won't feel the need to wait till summer to try it out! 1.) Mix together the honey and peanut butter until completely smooth. 2.) Stir mixture into softened ice cream. Make sure that the ice cream is soft enough to allow you to mix in the peanut butter/honey really well to incorporate it into every bite. 4.) Sprinkle with half of the chopped cashews. 5.) Spoon half of the chocolate fudge on top of the cashews. Not pretty, but man do those clumps of fudge taste amazing! 6.) Spoon the remainder of the ice cream mixture on top and sprinkle with the rest of the cashews. 7.) Drizzle remaining fudge on top. You may have to warm the fudge up a little to make it easier to drizzle. Work quickly though because as the ice cream melts it can start to over flow the pie crust. I bought the extra large pie crust this time and that really helped with the overflow problem. 8.) Freeze for at least 12 hours before serving or overnight if possible. Oh my word you had me at Peanut Butter! Looks yummy! Oh my heavens! I can not wait to try this! It looks amazing! I am visiting from Adventures of a DIY Mom and am now your newest follower. I'd love it if you visited my blog as well! Thanks for linking to Take-A-Look Tuesday - you were featured today! Wow! This looks sooo good. Thanks for sharing at Terrific Tuesdays. Wowza this looks great! I just gave you a tasty pin on Pinterest. thank you for linking up to Pinterest Saturday! You rock! This looks AMAZING!! I love peanut butter. I am going to have to try this out! YUM!! Thanks for sharing this as well at Thursday's Temptation. It's dangerous reading your blog late at night. This looks tasty! Thanks for sharing at oopsey daisy! It's torture to be seeing this late at night, it look so good. I want a piece, and I love peanut butter. Thanks for sharing the recipe and for sharing your creative inspiration at Sunday's Best. you totally know your audience when you linked up to my topsy turvy tuesdays! my pinterest treat board is FULL of peanut butter and chocolate recipes. I'm featuring your pie this week! What Will You Pay Full Price For? Dark Chocolate Shamrock Candies- Pinterest Fail!